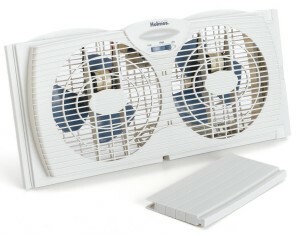 Give yourself some relief from hot weather with this Holmes HAWF2021 Dual Blade Twin Window Fan. This unit features the ability to draw in cool air from the outdoors or exhaust the stale indoor air. Operates quietly and efficiently, this Dual Blade Twin Window Fan is ideal for living room or bedroom use. With its versatile design, this fan can be used on a desk, table or mounted to a wall to meet your requirement. Its extender panels ensure a safe and custom fit. Don’t worry if you live in a large room, this unit features a large blade diameter and motorized oscillation, helping to deliver powerful airflow in large living areas where there is ample floor space. Its smaller blade size and small footprint make it ideal for personal space cooling and is ideal for use in bedrooms, office cubicles, or dorm rooms.